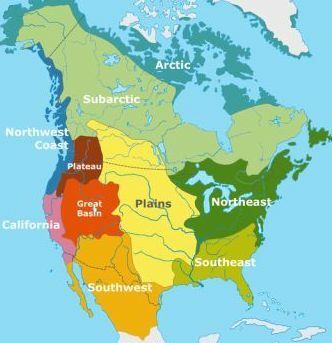 This article contains interesting facts, pictures and information about the life of the Aleut Native American Indian Tribe of the Arctic cultural group. Summary and Definition: The Aleut tribe were semi-nomadic fishermen and hunters of the Arctic cultural group. The Aleut tribe live in the Aleutian Islands and the western portion of the Alaska Peninsula of northwestern North America. The Aleut people used kayaks for transportation and fishing and lived in semi-subterranean, sod-covered, structures called barabaras. This article contains fast, fun facts and interesting information about the Aleut Native American Indian tribe. Find answers to questions like where did the Aleut tribe live, what clothes did they wear and what did they eat? Discover what happened to the tribe with facts about their history and culture. The Aleut are people of the Arctic Native American cultural group. The location of their homelands are shown on the map. The geography of the region in which they lived dictated the lifestyle and culture of the Aleut tribe. 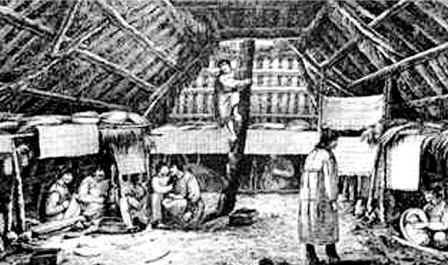 The Aleut people lived in semi-subterranean, sod covered (earth covered), arched-roofed structures called barabaras. The clothes, mitts and boots worn by the Aleut tribe were made from animal skins and furs from sea lion, walrus or sea otter skins. Bird feathers and puffin skins were also used when making clothing. 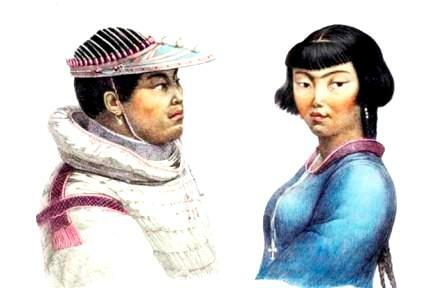 Both men and women wore long tunics often accompanied by loose pants. 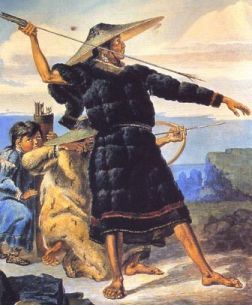 In the winter the Aleut wore fur-lined, hooded coats called Fur Parkas. The Aleut of Alaska wore fitted clothing in contrast with the loosely hung garments of other regions. For fishing trips in their kayaks the men would wear a light, waterproof coat, generally made from sea otter intestine, called a Kamleika. In the winter they wore soft Mukluk boots made from sealskin. In the summer it was not unusual for the Aleut to go barefoot. The Aleut man shown in the picture is wearing a special fur robe and weaved hat made from from dune wildrye grass that was used during important ceremonies. The Aleut Tribe was one of the most famous tribes of Native American Indians. Discover the vast selection of pictures on the subject of the tribes of Famous Native Americans such as the Aleut nation. The pictures show the clothing, war paint, weapons and decorations of various Native Indian tribes, such as the Aleut tribe, that can be used as a really useful educational resource for kids and children of all ages. We hope you enjoy watching the video - just click and play - a great social studies homework resource for kids .